In the last issue we discussed the story of light coming through Box Tunnel on Brunel's birthday. It is a romantic notion and has resulted in considerable investigation. Patricia wrote to us with first-hand knowledge of the research by her family. The general consenus is that light does come through the tunnel but the mystery isn't fully solved because the actual date that it happens is unclear, as is Brunel's intention in the matter. Was it deliberate on his part or the consequence of the civil engineering accuracy of his builders? You may be amused by the following. 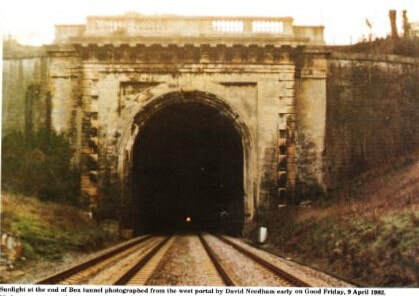 In the late 1960s, when we lived in Monkton Combe, my husband would get up in the very early hours for a few days every April and September and drive to Box Tunnel. He had a lineside pass and was able to go down to the track to check if the sunrise did actually shine through the tunnel on Brunel's birthday (or thereabouts). He encountered rain, snow, mist, trains at the vital moment but eventually, one September morning, he saw what he thought at first was a light on a train but then realised it was the sun rising at the eastern end of the tunnel. The light only penetrated about two-thirds of the way through, illuminating the rails. He went to the eastern end and down the wooden steps to the tunnel entrance where he thought the best way to check the phenomenon would be to have several observation points within the tunnel starting at that end. That, of course, is what happened when the line was closed on Brunel's birthday this year and cameras were in place to record the event. My husband wasn't always the only person there. One year on Brunel's birthday two young men arrived who had driven from Stoke-on-Trent. On another occasion he encountered two lecturers from Bristol University who were hoping to set a maths examination question on the phenomenon and wanted to see for themselves. They did however point out that Brunel's refraction tables would not have been as accurate as modern ones and the leap year cycle also came into the equation. I would add that in the 1960s our children were very young and we were used to getting up in the early hours but now, 50 years later, it would be very hard to raise any enthusiasm for such a venture, or indeed to get to the office at 9.00 am ! Patricia added: Talking to my husband about this he seems to remember that one of the academics surmised that the two reverse curves of the line west of Chippenham before the tunnel had no purpose other than to align the track for the sunrise. Can anyone confirm this and does this prove Brunel's intention in the alignment? Any thoughts from the experts out there please ?